TED Salons welcome an intimate audience for an afternoon or evening of highly-curated TED Talks revolving around a globally relevant theme. 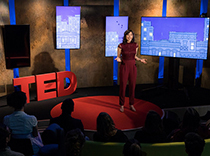 A condensed version of a TED flagship conference, they are distinct in their brevity, opportunities for conversation, and heightened interaction between the speaker and audience. Do you want to attend a TED Salon event? Sign up, select your favorite topics, and tell us a bit more about yourself so that we can invite you to the right events. All TED Salons are crafted by TED's world-renowned curation team to uncover the world's most innovative ideas. Many TED Salon events take place at the TED World Theater in New York City. All Salons are free to attend. If we want to do things differently, where do we begin? So many systems and hierarchies have not changed for generations, but almost everything in our world could use a fresh look. From everyday practices to our biggest challenges, let's take some time to Rethink. Watch the talks from previous TED Salon partner events.